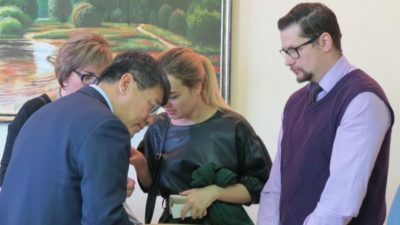 On November 2, Novosibirsk entrepreneurs met with the Chinese delegation headed by the head of the Department for Attracting Investments of the Administration of the People’s Government of Karamay, Xinjiang Uyghur Autonomous Region of the People’s Republic of China Mr. Yan Lijun. 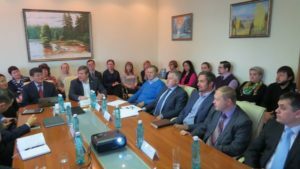 The business meeting took place at the Novosibirsk City Chamber of Commerce and Industry. The representative of the Trade and Economic Cooperation Department of Special Economic Zone of Karamay city Shi Lei, executives and top managers of 10 Chinese companies interested in collaboration in different economic fields such as building, petrochemistry, logistics, agriculture, food manufacturing, tourism and etc. took part in the negotiations from the Chinese side. Russian side was presented by the President of the Novosibirsk City Chamber of Commerce Yuri Bernadsky, the director of Byte-Transit-Continent logistic company Alexey Shpikelman, deputy director of Novosibirsk International Airport Oleg Podkopaev, director of Novosibirsk plant of preinsulated pipes Nikolay Shapovalenko, the President of Siberian Union of transport and logistic companies Sergey Maksimov, deputy director of Novosibirsk Association of Tourist Organizations Svetlana Fomenko and more than 30 representatives of Novosibirsk logistic, touristic and manufacturing companies. 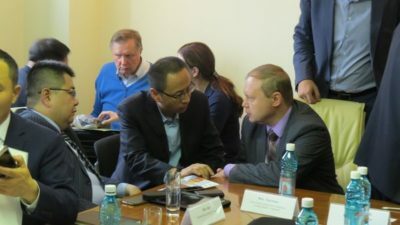 Yuri Bernadsky greeted Chinese delegation and noticed that it is the second meeting Chinese and Novosibirsk companies, which is held at the Novosibirsk City Chamber of Commerce and Industry in 2018. The number of participants of the meeting means mutual interest of two countries, and Xinjiang Uyghur Autonomous Region is a perspective partnership direction for Novosibirsk manufacturing companies. 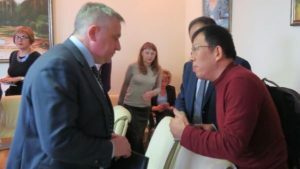 Yan Lijun mentioned that border cities of Russia and the People’s Republic of China have a dynamic cooperation, and the administration of Karamay city expects a close collaboration with Novosibirsk business. Karamay is a young city, its population continues to increase. According to the statistics, in 2017, the population of Karamay was 440 thousand people. The city has a well-developed infrastructure. Karamay is a transport hub, which has a direct transport connection with 19 main cities of the People’s Republic of China. The city is presented as a touristic center. The educational and medical tourism is making progress too. Nevertheless the industrial sector is also highly developed. The extraction and processing of oil is the basis of the city’s economy. Today, annual oil production is about 11 million tons. More than 100 companies provide different equipment for oil and petrochemicals extraction. Other spheres of economy are developing too, such as informational and medical technologies, finance, tourism and logistics. The head of the Chinese delegation Mr. Yan Lijun noted that Chinese companies are interested in partnership with Russian companies in above-mentioned spheres, also in cultural exchange. 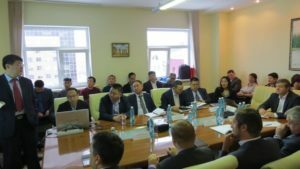 During the meeting, representatives of Novosibirsk companies received the opportunity to talk in detail about their products and services, to present the export potential of the Novosibirsk region to the Chinese delegation, to exchange contacts. Summing up the meeting, Yuri Bernadsky noted that there are many opportunities for cooperation between Russian and Chinese businesses in different spheres of economy. The parties agreed to exchange relevant information and to consider the possibility of establishing mutually beneficial cooperation.